Buying a used vehicle from a registered car dealer in Ontario offers you some consumer protection. Purchasing a vehicle from a private individual, however, provides no such protection. You need to be aware of any risks before you buy a used vehicle in Ontario. In Ontario, new and used vehicle sellers are regulated and licensed by the Ontario Motor Vehicle Industry Council (OMVIC). OMVIC ensures that those individuals selling cars are legitimate and above board. An OMVIC license doesn’t guarantee you’ll never run into an issue, but if you do there is an agency that assists in sorting out buyer disputes. In short, there’s some accountability. If you purchase a used vehicle from a private seller, no such protections are in place, and you should be extra cautious to ensure that you’re not getting ripped off. ‘Curbsiders’ are non-licensed individuals that sell vehicles illegally. They are becoming increasingly more common, especially with the rise of sites like Kijiji and Craigslist. You may wonder why it matters if a seller is licensed or not when you’re really only looking for the best price. You need to be aware because ‘curbsiders’ purchase vehicles and resell them without any accountability to you! In many cases they purchase the vehicle for cash, clean it up just enough to get it on the road and sell it to the next person with no real regard or responsibility afterwards. To avoid taxes or being tracked by the Ministry of Transport—and you–they usually don’t transfer ownership into their name at any point. Sometimes they even purchase, repair and resell damaged vehicles, some of which are not yet fit for the road. 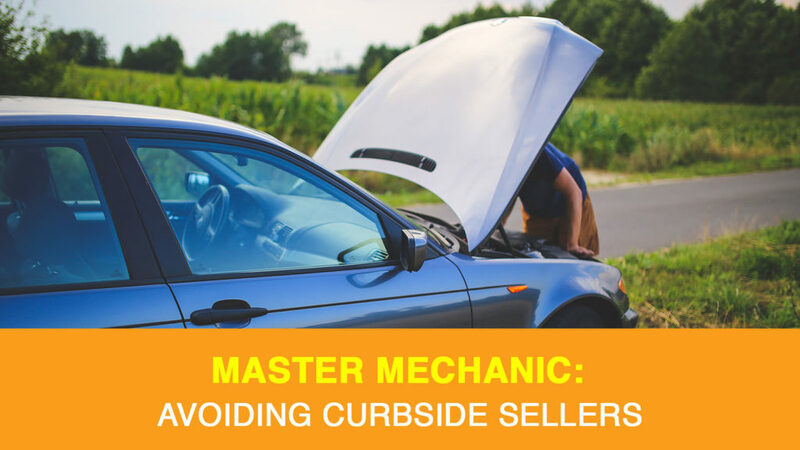 We talked to a Master Mechanic and got the scoop on ‘curbsiders’ and some tips to avoid dealing with them. After the initial contact–before you meet–ask the seller if they own the vehicle and can provide the history for it. When you arrange to meet the seller to see the vehicle, tell them to bring the Used Vehicle Information Package (UVIP) with them, along with the ownership. Ontario law requires a UVIP, and a seller must provide one to the purchaser. ‘Curbsiders’ typically won’t want to provide one as it will show that they do not own the vehicle. Once you have the seller’s phone number, use the search feature in Kijiji and Craigslist to see if they have any other vehicles for sale. Multiple cars listed under the same phone number is a big red flag that you are dealing with an unlicensed seller. Avoid meeting after dark so you can have a good look at the vehicle. If the price seems too low to be true, it probably is. Avoid being drawn in by bogus claims, such as, “I’m leaving the country for a bit,” or “I’m selling it for my aunt who never drove it”. While there is a possibility that they may be telling the truth, it’s more likely they’re a curbside seller. If you do arrange to look at the vehicle (during the day) check for apparent body damage, differences in paint colour and finish, and excessive tire wear. Use your nose and be aware of any musty smells that could indicate the vehicle was in a flood situation. Also, check the trunk for any fluids that might be topped up regularly and point to a potential problem. Lift the hood and make sure all the fender bolts line up and there isn’t any evidence of crumpled and straightened body panels. Curbsiders are notorious for this! Check all fluid levels to ensure they are full and reasonably clean. Road-test the vehicle with the radio off (you can test it afterwards). Listen for unusual noises, how the car runs, and the shifting of the transmission. You’ll want to make sure that the vehicle drives straight without pulling to one side or the other, and that it stops without any noise from the brakes. Have the vehicle inspected by a trained technician that knows what issues to look for. Master Mechanicprovides pre-purchase inspections and can spot things that most buyers may not pick up. There is usually a small fee to inspect your potential purchase, but it may save you lots of money down the road. Buying a used vehicle in Ontario can save you a lot of money, but you need to be aware that not everything may be as it seems. Be cautious and ask questions to be sure you are getting the information you need to make an informed decision. If you need a second opinion on something or want to have your vehicle inspected, contact your local Master mechanic today!